Depending upon where your horse's anatomy and motion put the saddle (and we don't advise artificially fighting that as long as it's stable and properly supported by the back), the rider may feel tipped forward or back (very rare). There are several ways to balance the rider. 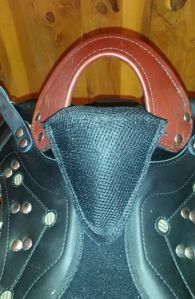 The Pommel Bolster (or front riser) is a wedge shaped piece that velcros between the seat and the front of the base. It can tip the pelvis a small amount and also narrows the twist and deepens the seat a bit. A popular option for all of these reasons, it can be moved forward and back for a lesser or greater effect. Panel shims are inserted into the front of the velcro opening panels and don't change the fit to the horse, but lift the rider which also helps the horse so the rider doesn't put the horse on his forehand. Pad shims are inserted into the front of the pad. This is easiest if switching between horses and only one needs shims. Must be used with pad inserts. Can affect the rider's pelvis tilt, refines the twist, and slightly deepens the seat. 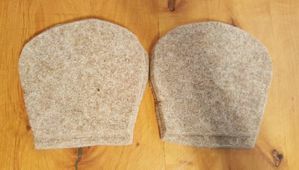 Beveled wool felt shaped to fit the front of the Ghost panel. Two pieces per side, use the bigger one alone for a 1/4" lift, both together for a 1/2" lift. You can also shim one side more than the other if your horse has a bigger shoulder (shim the smaller shoulder). If panel shims aren't enough (although in that case you should consider getting a rigid pommel base) or you have closed panels, it's also possible to shim in the pads. 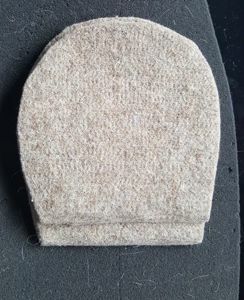 You want to make sure you are still using the foam pad inserts so you don't put a transition next to the horse, plus they'll stay in place better. Wedged shim inserted between base and closed panels. Perfect for those who want the classy look of the closed panels (especially with a matching color/material) but need a little lift in front to balance the rider for horses who might be downhill where the saddle wants to side or who have less curvature than the Ghost base.